Draw arm muscles front view. 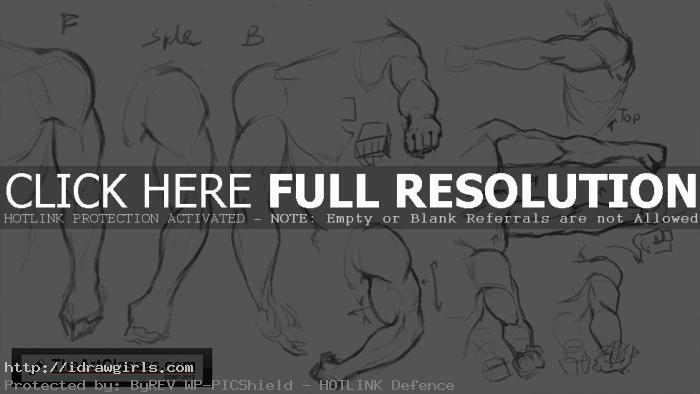 This video tutorial will show you how to draw arm muscle front view tutorial. Basically, I usually start off with basic shapes. You can scroll down further to see step by step images with instruction. You can click on the labelled buttons below the video to watch any of the arm drawing video tutorials. The newest one is how to draw muscular arm from the front, side and back (2016). And it shows you how to draw arms from various positions. You can scroll down further to see step by step images with instruction. I just update the muscular arm drawing video tutorial. 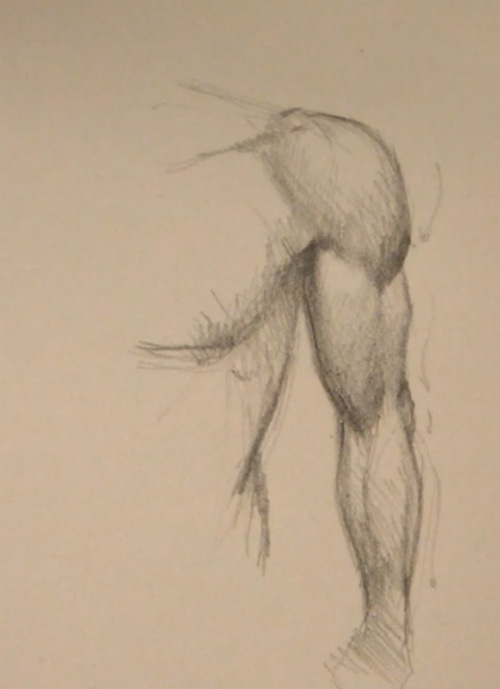 This drawing lesson is part of anatomy drawing video tutorials. 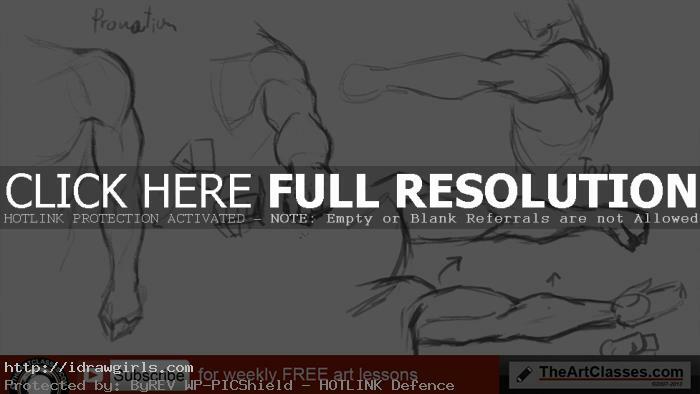 This video shows you how to draw muscular arm for a man. It shows you how to draw from the front view, side view, and back view. You will learn how to draw Deltoids, Biceps, and Triceps on the upper arm. Then down to forearm, we have (from closer to torso then further out) Pronator, Supinator, Flexor and Extensor closer below to the wrist. Anyway, watch the video then you will know exactly how to draw them and where they should locate. 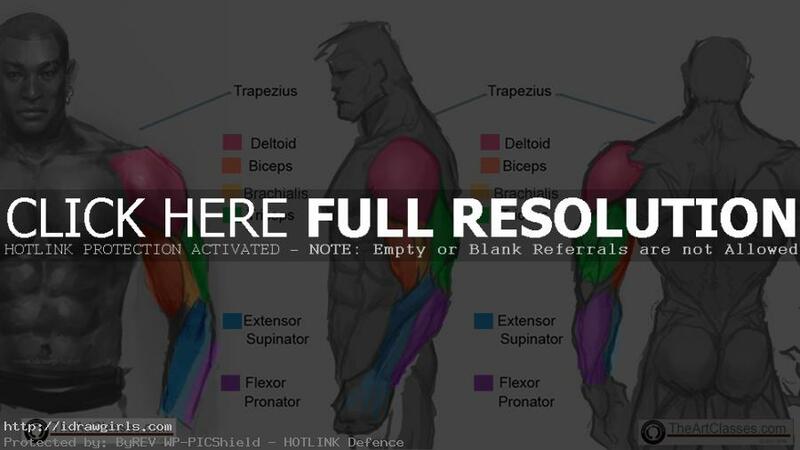 It also shows you how to draw muscle groups from deltoids, biceps and triceps. Also muscle groups along the forearms. At the mid-section of the video, it shows you the different of pronation and supination position of the arm. Then, it also demonstrates how to draw biceps and triceps in curl position. Last part of the video shows you how to draw extended arm in a closed fist and open palm positions. You can also download a premium video tutorial on how to paint muscular arm from the link on the top right corner of the video. I use geometry shapes to simplify the form. After you have a rough shape for a sketch. Then you can start tightening up your drawing creating shoulder muscles. Then along the way down we have bicep closer to the torso (from front view) then triceps on the outside. Then down to forearm, we have (from closer to torso then further out) Pronator, Supinator, Flexor and Extensor closer below to the wrist. Anyway, watch the video then you will know exactly how to draw them and where they should locate. The following tutorial is part of male muscle anatomy study. I am studying the sketch, draw and render from the side view of muscular arms character design study that can be used for comics, manga, anime and video game concept art. Learn how to draw simplify arm muscle structure and upper body using simple shapes and render. If you are interested in more similar tutorials there are How to draw arm muscles side view and how to draw arm muscles back view. Also Facial structure tutorial: How to draw face basic and How to draw the realistic face front view. Below is step by step drawing the arm muscle front view. More step by step images. Great job! Really helped me.